Despite rising VAT and tough economic conditions, the white spirit market is strong, with RTD products shaking up the sector. Only a few years ago, the decline of the ready-to-drink (RTD) market, as brands such as Bacardi Breezer and Smirnoff Ice lost their lustre, looked unlikely to be reversed. Stories of its demise, however, appear to have been premature, as premium ready-to-serve cocktails and spirit-and-mixer combinations have reinvented the sector. Although far removed from the era of alcopops and FABs (remember those - flavoured alcoholic beverages?) they are nonetheless aimed at 18- to 24-year-old drinkers. While innovation in any category is good news, there is a real risk that this wave of new RTDs will cannibalise the white spirits market. RTDs are fulfilling a need all round. They are convenient, affordable and bringing in a better margin for producers, thanks to the lower tax applicable to these reduced-ABV drinks compared with straight spirits. A surge in the popularity of cocktails has boosted sales for various spirits. As in-home drinking increases at the expense of the off-trade, however, making cocktails at home requires skill and an extensive drinks cabinet. 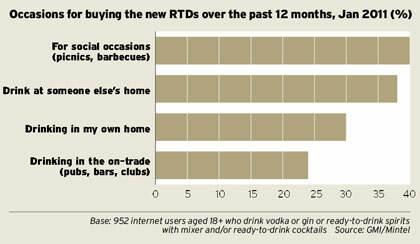 RTDs such as Smirnoff Vodka and Apple Juice and Bacardi Classic Mojito offer easy-to-make cocktails on the sofa, although they are just as likely to be drank at picnics, barbecues and other social occasions. What of the classic white spirits, vodka and gin? Vodka enjoyed exponential growth over the previous decade, but sales are declining. 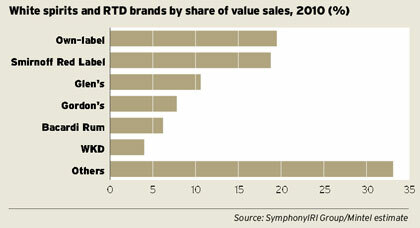 Overall, the white spirits and RTD market was worth almost £4.1bn in 2010, according to Mintel. In tough economic conditions, this is a good performance compared with other alcohol sectors. 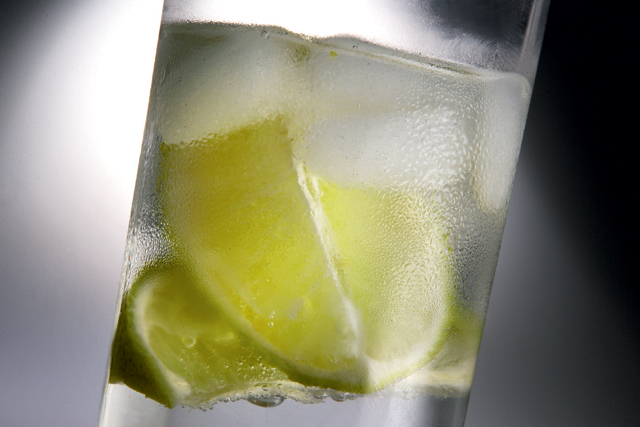 Vodka dominated, accounting for 55.7%, with sales of £2.3bn. Meanwhile, gin has struggled to appeal to younger drinkers (18to 34-year-olds prefer vodka and white rum), but it is more popular with the 35-plus age group. Sipsmith, the first new gin distillery in London for nearly 200 years, launched in 2009. A small, artisan brand, which also makes vodka, it caused a buzz in the sector, bringing attention and innovation to the gin category and winning awards. Its timing also tapped into localism and provenance trends in the grocery market. 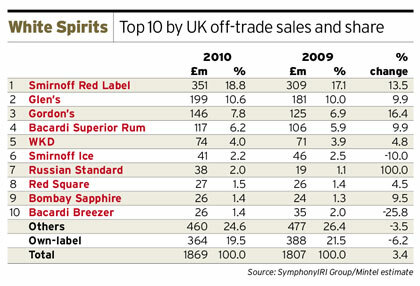 The retail price of spirits has risen dramatically since 2008 due to the introduction of the government's tax escalator. 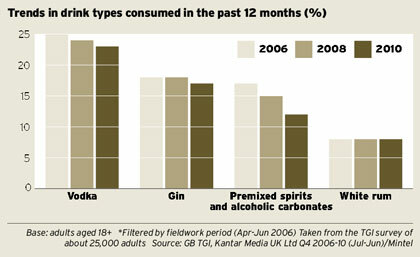 This and the VAT rise in January mean that alcohol prices have increased by up to 10% in 2011. 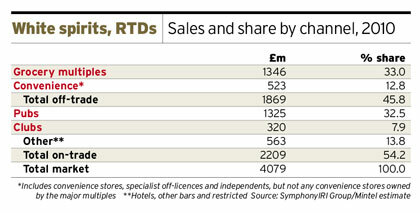 This has contributed to the interest in RTD development: duty accounts for 46% of the retail price of a bottle of Smirnoff Red, compared with 23% for the Smirnoff Cocktail Mojito with Key Lime, according to Mintel. Rising prices also add to the importance of developing premium brands that justify these higher price tags and create a sense of relative value and worth in consumers' minds. The demand for premium-quality spirits is there; 64% of people say they can taste the difference when they drink quality vodka, with 59% saying it is worth paying more for premium vodka, according to GMI. Diageo dominates this category with the leading brands in both vodka (Smirnoff Red) and gin (Gordon's), as well as being a driving force behind the RTD innovation. It is testament to the importance of sustaining marketing and advertising spend during a recession: Diageo has invested in promotional activity and its brands have remained strong. WKD is one of the few older RTD brands to boost its sales in 2010 thanks to significant advertising spend, and, while less popular than in their heyday, brands such as Bacardi Breezer continue to bring in revenue. White spirits is a mature sector that benefits from strong brands. Rising VAT, inflation and raw-material costs mean that prices have increased considerably, and by 2015 Mintel predicts sales of white spirits and RTDs will reach £4.4bn, an 8% rise on 2010. Volume sales are set to stay relatively constant, which may be a more accurate reflection of the state of play in this sector.